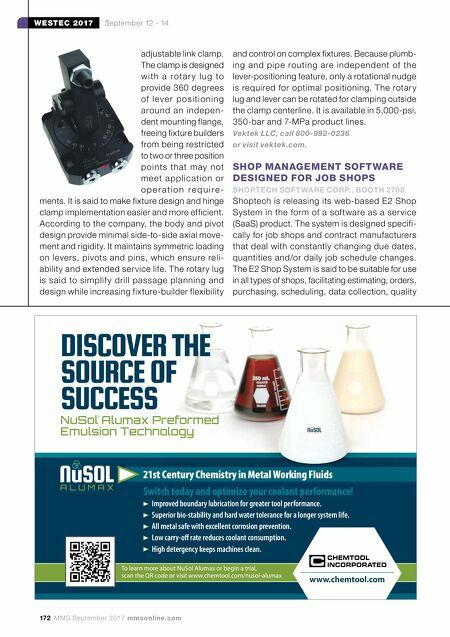 mmsonline.com September 2017 MMS 173 WESTEC 2017 September 12 - 14 control, shipping and accounting. Shoptech Software Corp., call 800-525-2143 or visit shoptech.com. COATING ON TURNING-GRADE INSERTS RESISTS ADHESION, MICROCHIPPING SUMITOMO ELECTRIC CARBIDE INC., BOOTH 2725 Sumitomo will showcase its line of AC1030U turning grade inser ts for precision machining, which are available in many geometries, including the company's GND grooving line. The inserts have an Absotech Bronze PVD coating and a substrate, which are designed to create a high- quality cutting edge, resist adhesion and micro- chipping, and result in better surface finish. Sumitomo Electric Carbide Inc., call 800-950-5202 or visit sumicarbide.com. MACHINING CENTERS FOR SMALL-LOT, HIGH-MIX / LOW-VOLUME APPLICATIONS SOUTHWESTERN INDUSTRIES INC., BOOTH 1703 Southwestern Industries' Trak machines are said to increase productivity in shops that engage in small-lot or high-mix/low-volume work. Products designed for the former application include the Trak family of knee mills, bed mills, lathes and knee mill retrofits. Machines designed for the latter application include the Trak 2OP portable VMC and Trak LPM vertical machining center, both of which contain built-in Jergens ball locks to facil- itate quick change-overs. A l l Tr a k m a c h i n e s f e a t u r e p o w e r f u l b u t Coolant- Thru! End Mill Holders New Deliver coolant where you need it! 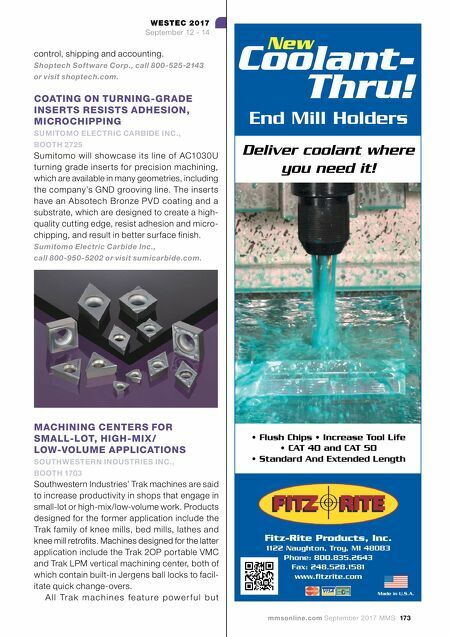 Fitz-Rite Products, Inc. 1122 Naughton, Troy, MI 48083 Phone: 800.835.2643 Fax: 248.528.1581 www • Flush Chips • Increase Tool Life • CAT 40 and CAT 50 • Standard And Extended Length Made in U.S.A.